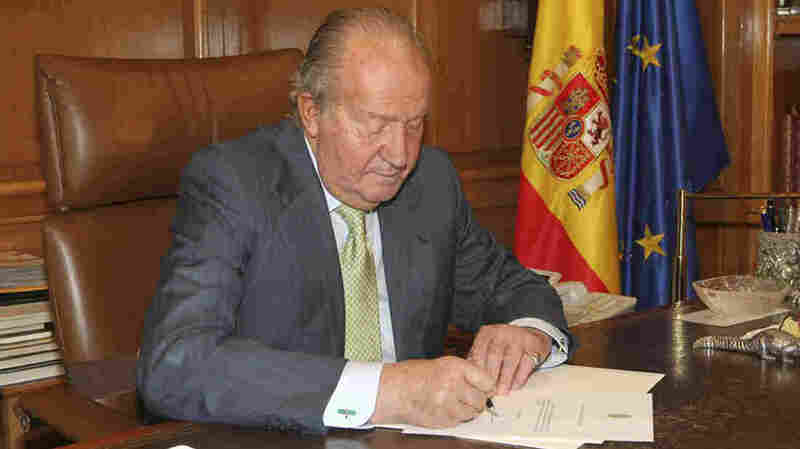 Spain's King Juan Carlos Will Abdicate In Favor Of Son : The Two-Way At a hastily called news conference Monday, it was announced that the 76-year-old king will step down. His 46-year-old son, Crown Prince Felipe, is expected to become king. Spain's King Juan Carlos signs a document in the Zarzuela Palace, planning his abdication, in this photo released by the Royal Palace. Juan Carlos will be replaced by his son, Crown Prince Felipe. The news comes as something of a surprise: King Juan Carlos of Spain is abdicating and will be succeeded by his 46-year-old son, Crown Prince Felipe. Spanish Prime Minister Mariano Rajoy made the announcement at a hastily called news conference Monday, saying that Juan Carlos is "convinced that this is the best moment for a change in the leadership of state with complete normalcy," according to El Pais. The Associated Press reports that the king, who has had health problems in recent years, "told Spaniards in a nationwide address that he started making a plan to give up the throne after he turned 76 in January." "Juan Carlos didn't specify which problems his son must address as the next head of state for Spain. But the king stressed Felipe will need to 'tackle with determination the transformations that the current situation demands and confront the challenges of tomorrow with renewed intensity and dedication.' "
In 2012, Juan Carlos made headlines for an ill-timed gaffe: going on a trip to hunt elephants in Africa when his country was struggling with profound financial problems. In addition to showing he was out of touch with regular Spaniards, the trip led the national branch of the World Wildlife Fund to remove the king as its honorary head, a post he had occupied for more than 40 years. Other family scandals have tarnished the image of Spain's royalty, including a corruption probe that named his youngest daughter and her husband as suspects. But Juan Carlos is also credited with introducing and protecting democracy in modern Spain. After coming to power following the death of dictator Francisco Franco in 1975, he ordered democratic elections to install a new government in a country that was still largely divided along the same lines that fought its civil war in the 1930s. And when an attempted military coup threatened the country's young government in 1981, Juan Carlos put his weight behind democracy, going on national television to condemn an attack on Parliament and ordering his backers in the armed forces to shut down the rebellion. As Agence France-Presse notes, Juan Carlos kept his son with him on that tense and dangerous day. "I wanted him to see what one has to do when one is king," he said.